…documents detailing a special operations campaign in northeastern Afghanistan, Operation Haymaker, show that between January 2012 and February 2013, U.S. special operations airstrikes killed more than 200 people. Of those, only 35 were the intended targets. During one five-month period of the operation, according to the documents, nearly 90 percent of the people killed in airstrikes were not the intended targets. In Yemen and Somalia, where the U.S. has far more limited intelligence capabilities to confirm the people killed are the intended targets, the equivalent ratios may well be much worse. And upon viewing the leaked Operation Haymaker documents, it becomes clear that America’s drone operations in Afghanistan have admittedly very little tactical value in eliminating specific “terrorists,” and the actual “benefits” noted amid these operations is instead the perpetuation of terror, fear and sociopolitical division in targeted areas, including among civilian populations. Considering these noted “benefits,” high civilian casualty rates of up to 90% makes sense. If the goal is to simply instill fear, it doesn’t matter who dies, just as long as someone does. It should be remembered that nations like Afghanistan, Yemen, Somalia, and Pakistan are home to fiercely independent networks of localized tribes. These tribes, particularly in Yemen or Afghanistan, refuse to recognize the authority of US-installed client governments and their existence not only undermines central government authority, they pose a direct threat to its continued existence. This helps explain another aspect of America’s drone operations that have left the general public occasionally outraged but mostly confused. That is, the propensity of drones striking weddings. In Western culture, weddings are generally a family affair with little to do with the actual community they take place in. In traditional cultures like Yemen and Afghanistan, weddings are a central community affair. Beyond just friends and family, everyone from the community participates, with various local religious, educational, political and even military leaders attending or even presiding over the event. And before any strike is taken, there must be near-certainty that no civilians will be killed or injured — the highest standard we can set. Considering this, it is likely such operations, certain to incur civilian deaths, are instead approved of for the specific purpose of obliterating the very source of a targeted community’s strength and independence, leaving local people reeling, leaderless and at the mercy of the central government Washington has installed into power. In other words, the US is not necessarily “hunting terrorists,” it is eliminating resistance to the political order it is attempting to reach into targeted nations with. Uprooting Terrorism, or Merely Trimming Its Branches? However, for many geopolitical analysts, drone-borne assassinations should immediately raise questions revolving around the face-value wisdom of targeting individuals who have proven easily replaced over the years by a seemingly endless supply of terrorists and terrorist leaders. The targets the US is eliminating have no impact on terrorist finance, logistics or military capabilities. In fact, throughout the Intercepts reports, citing US government documents, it is noted over and over again that America’s drone operations have done little to degrade the capabilities of terrorist organizations. This is particularly suspicious considering the US has created what is essentially the global industrialization of drone-borne assassinations with drone bases dotting Africa, the Middle East and Central Asia along with huge networks of both conventional and covert military force to both facilitate and augment drone strikes. But a lack of any discernible impact on terror despite this industrialized killing-machine is only suspicious if one assumes that the US actually endeavors to stop terrorism with it. So what is the US actually doing and why isn’t the US instead attempting to identify and target the very source of the terrorism it claims to be fighting globally? If we liken terrorism to a large weed, we can compare America’s drone wars to merely trimming its branches rather than digging it up by the root to completely destroy it. This would indicate that the US’ goal is not to destroy terrorism, but rather guide its growth along a specific, desired path. The self-titled “Islamic State” (IS) and Al Qaeda before it, operate a global network and are currently waging war on multiple fronts. What amount of weapons, money, political support and transnational logistical arrangements must exist to support warfare stretching across North Africa, engulfing the Levant, creeping across Afghanistan and even attempting to take root in Southeast Asia? In Afghanistan during the 1980s it is now common knowledge that Al Qaeda waged war with explicit US and Saudi support. Evidence reveals Al Qaeda likewise participated in US-NATO backed hostilities in Serbia during the 1990s. And today, it is clear that Al Qaeda and IS are both the recipients of immense state sponsorship in Iraq, Syria, Libya, Afghanistan and beyond. There is no other explanation as to how either organization has sustained full-scale war against the combined armed forces of Lebanon, Syria, Iraq, Iran and Russia in the Levant alone, saying nothing of IS’ military operations in Libya or Afghanistan. The US and its allies claim to be arming, funding and training only “moderates” but it is clear that these “moderates” do not exist in any significant capacity upon the battlefield. And in the rare instances they are apparent, they are quite literally fighting within the ranks of Al Qaeda and IS. It has been and still clearly is the policy of the United States and its allies to use terrorism as a geopolitical tool. It serves the duel purpose of serving as a pretext for Western military intervention, as well as a mercenary force with inexhaustible ranks used to fight the West’s enemies where Western armies cannot intervene. But a massive global network comprised of heavily armed, deeply indoctrinated and incredibly dangerous men and subsidiary organizations are bound to need “trimming.” Groups may take their US-Saudi-funded madras programming and training too far, operating beyond the mandates set forth by their state-sponsors and thus require liquidation. As president, [Barack Obama] promised to end America’s wars in Iraq and Afghanistan. Since taking office, he has cut the number of U.S. troops deployed to war zones around the world from 180,000 to fewer than 15,000. It is clear that not only have the wars not ended, they have expanded, if not in terms of US troops involved, in terms of where the US is involved through this army of “irregular troops” it cultivates. The wars are not meant to end, but to perpetuate themselves, devouring one nation and leading to a pretext to begin undermining, dividing and destroying the next. The US has created for itself an open-ended pretext to remain “engaged” globally across multiple continents militarily and geopolitically. Washington could not do so without the threat of terror ever-looming, the ranks of terrorist organizations seemingly bottomless and its ability to surgically “remove” elements from this weed of terrorism it is cultivating in order to get it to creep in the direction US policymakers and special interests desire. 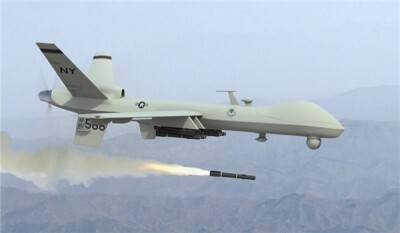 The world is beginning to realize that if a drone could ever truly end terrorism, it would need to fly above Washington or Riyadh, and until it does, the US will never “uproot” terrorism, but merely trim its branches as it carefully cultivates its growth toward strangling the planet.